Above: Edinburgh is built upon an extinct volcano. In places such as Salisbury Craig the volcanic rock formations are still visible. Edinburgh is a refreshing city. It was never a factory town and so does not have the heaviness that such cities are often burdened with in the post-industrial age. Instead, it has a wealth of graceful Georgian architecture. Add to that a great intellectual tradition that still manifests itself in a passion for the arts and you have a quite attractive cruise destination. Although it is not the largest city in Scotland, Edinburgh is the capital and seat of the Scottish Government. Although still part of the United Kingdom, Scotland has its own parliament and executive with responsibility for governing Scotland. Responsibility for certain matters such as defense, taxation and foreign affairs, however, remain with the UK government in London. In the private sector, financial services are an important part of the Edinburgh economy as is tourism. Edinburgh is a tourist friendly city. Many of its major attractions are located in the center of the city. Similarly, the major shopping streets, Princes Street and George Street, are in central Edinburgh. 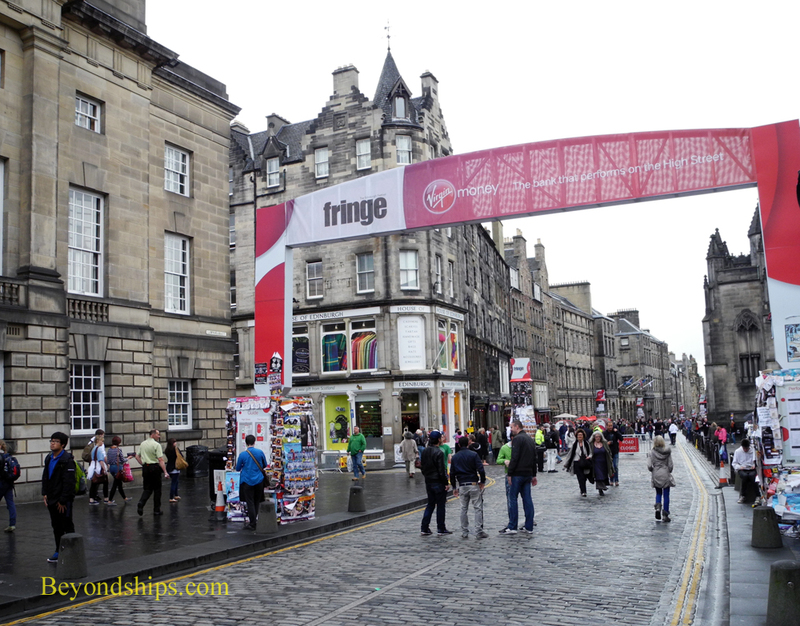 In addition to its permanent landmarks, Edinburgh is an attractive city because of its numerous festivals. 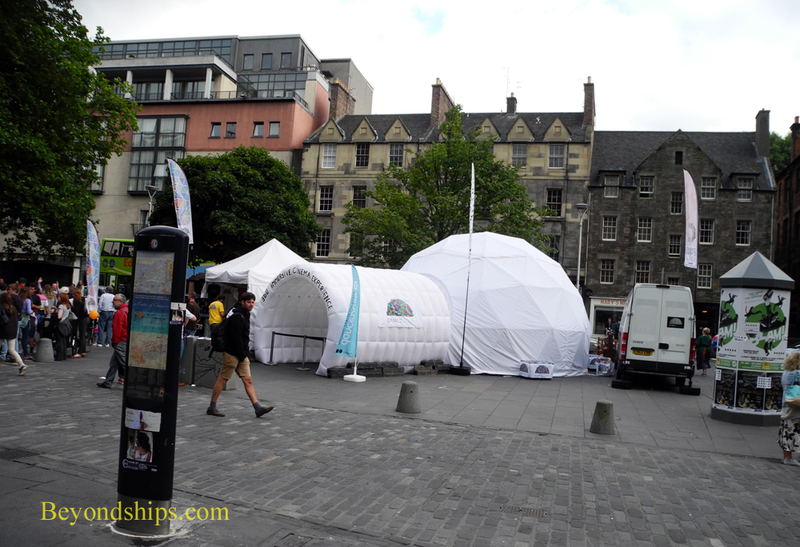 These include not just the Edinburgh International Festival and the avant garde Fringe Festival but also as festivals covering such things as film, science and books. They add a liveliness to the atmosphere with their street-side exhibits and young street performers. Located off of the North Sea on the Firth of Forth, it does rain quite a bit in Edinburgh, although less than in cities on Scotland's west coast. Moreover, Edinburgh's proximity to the sea gives it a more moderate temperatures than cities such as Moscow, which lie on the same latitude. Above: The Scottish Parliament Building. 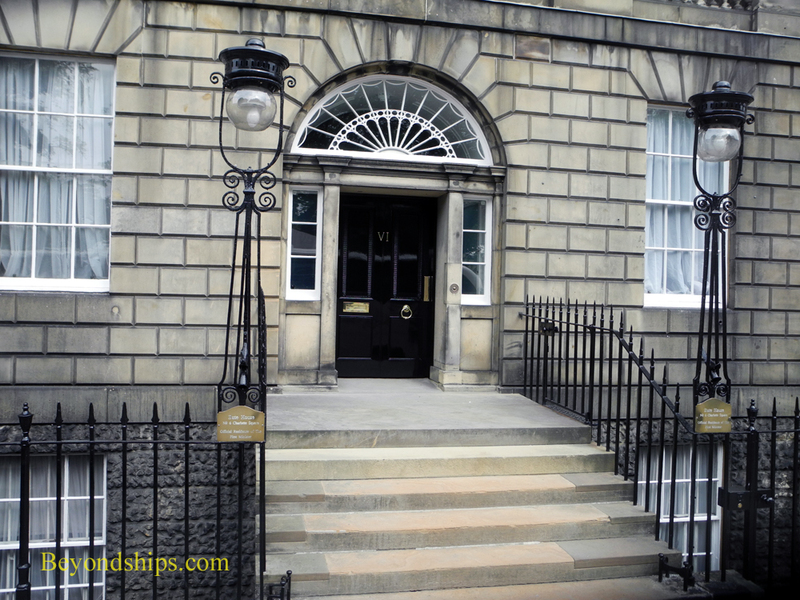 Below: The First Minister of Scotland's official residence, Bute House. Above: Edinburgh City Chambers is the seat of the City of Edinburgh Council. It is the former Royal Exchange and was designed by John and Robert Adam. Left: Edinburgh takes on a party-like feel during August when the Edinburgh International Festival and the Fringe Festival take place. Above: This Victorian version of the Mercat Cross stands near where the medieval version stood on the Royal Mile. Government and city proclamations were read and some executions carried out at the cross. Below: A section of the ancient city wall. Above: King George IV's successful visit to Edinburgh in 1822 helped to dispell the bad feelings between Scots and the monarchy that had existed since the Jacobite Risings. Above: Although there is a history of conflict between England and Scotland, the two nations have done very well when they have fought together side by side. In fact, some of the most notable moments in British military history were the work of Scots. The statue of above is in tribute to the Scots Greys whose charge was one of the pivotal moments in the Battle of Waterloo. Below: Sir Walter Scott, author of Ivanhoe and Waverly, was a leader in the 19th century revival of interest in Scottish history and tradition. The Edinburgh area has been inhabited since the 7th century B.C. Although Edinburgh is not a Roman town like London and Paris, the Romans did come to this area for a short time and mixed with the local tribe who it is believed had a stronghold on Castle Rock where Edinburgh Castle is today. The history of Scotland has often been a story of conflict with its neighbor to the south, England. Indeed, even prior to the formation of Scotland, the Goddoddins, who lived on Edinburgh's Castle Rock, were involved in a disastrous war with the Angles, the predecessors to the English, and Edinburgh became part of the Kingdom of Norththumbria. Around 843 A.D., the Picts and Scots joined together to form Scotland and set about driving the English out of Scotland. In 1018, King Malcolm II liberated Edinburgh. However, in 1296, the English were back and retook Edinburgh. The Scots drove them out in 1314 and in 1329, King Robert the Bruce granted Edinburgh a royal charter. But the English came back in 1335. Six years later, the Scots were again triumphant - - at least for a while. The crowns of England and Scotland were united in 1603 when King James VI of Scotland succeeded to the throne of England as James I. James, who was born at Edinburgh Castle, was a great grandson of Margaret Tudor, sister of King Henry VIII of England. When Henry's daughter Elizabeth died without children, James had the best claim to the throne. Although the crowns were united, England and Scotland remained separate countries, each with its own parliament. It was not until the Act of Union in 1707, that the two countries merged to become the United Kingdom. The union of the crowns did not end strife between England and Scotland. In 1649, the English Parliament executed King Charles I and declared the monarchy abolished. Scotland did not agree and declared Charles II to be king of both Scotland and England. An English army under Oliver Cromwell defeated Charles and his Scottish army at the Battle of Worcester and occupied Edinburgh. After the death of Cromwell nine years later, Charles regained his thrones. He was succeeded by his brother James VII and II in 1685. However, James had none of Charles' political savvy. He believed in the divine right of kings and was the Catholic king of a protestant land. Unpopular, he was deposed in the Glorious Revolution by William of Orange and James' daughter Mary. Although James fled to France, his progeny made several attempts to regain the thrones with Scottish assistance in what are known as the Jacobite Risings. In the 1715 rising, forces loyal to James' son, the “Old Pretender,” failed to take Edinburgh Castle and the Jacobite army was subsequently defeated. The Jacobites did much better in 1745, led by James' grandson Bonnie Prince Charlie, the “Young Pretender.” He occupied Edinburgh (except the Castle) and held court at Holyrood Palace. His army even invaded England but had to retreat and was defeated in the bitter battle of Culloden. 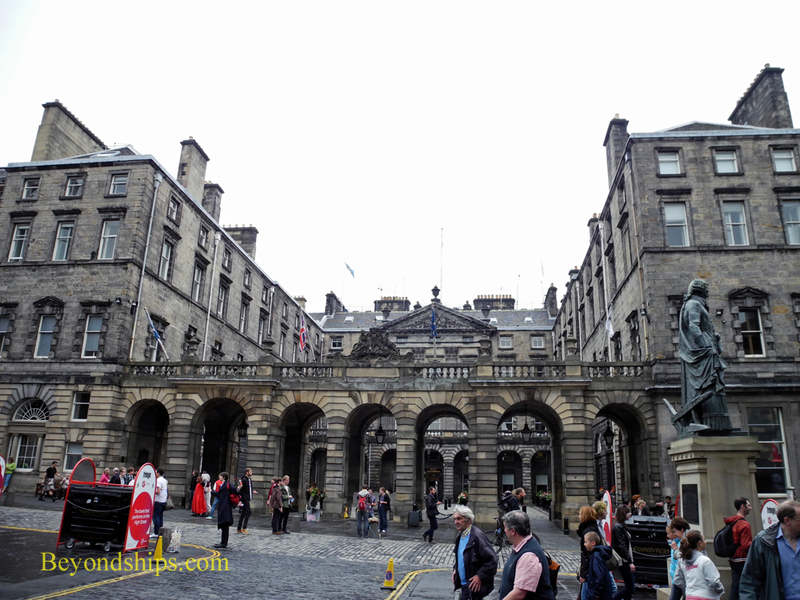 Until the mid-18th century, Edinburgh was essentially confined within its medieval walls. Because space was so limited, people lived in apartment-like buildings rising 11 stories or more. 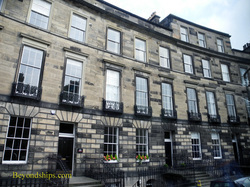 Some of these can still be seen in the Old Town section of Edinburgh. Something had to be done about the overcrowding and one of the world's most successful efforts at town planning resulted in the New Town, with its Georgian crescents and classically-inspired buildings. In the early 19th century, writers such as Sir Walter Scott were leading a revival of interest in Scottish history and culture. At Scott's urging, King George IV came to Edinburgh in 1822, becoming the first reigning monarch to visit Scotland since 1650. The pageantry of the visit including the King's appearance wearing a highland kilt was widely successful in creating good feeling toward the British monarchy in Scotland. Today, Queen Elizabeth comes to Scotland each year including time at Holyrood House.